The whole time I was reading this book, I was thinking what fun St. Aubyn must have had writing it. I loved St. Aubyn’s Patrick Melrose novels. They were so beautifully crafted, but, because the semi-autobiographical novels dealt with child abuse and substance abuse, they were also really rather bleak. 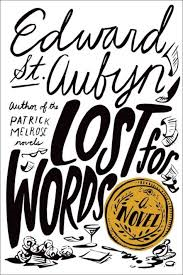 Lost for Words is a departure, a very pointed satire about the book prize industry, the kind of book prize St. Aubyn narrowly missed winning in 2006 for Mother’s Milk, one of the Melrose novels. The novel follows members of the jury for the Elysian Prize (none of whom actually read the books in the running) and some of the possible winners of the prize (their psychological disorders run the gamut). For most of the book, not one of them is in any way likeable, and if I have any quarrel with the book, it’s that three-quarters of the way through, the narrator decides that someone must emerge sympathetically from the blanket of his malice. The softening for two of the characters at that point does not quite ring true, and I kept waiting for another skewering. Nietzsche announced the death of God; Foucault announced the death of Man; the death of Nature announces itself; with no need for an intermediary. As these three elements of our classical discourse dissolve in the acid rain of late Capitalism, we are offered the consolation of its own pale triumvirate: the producer, the consumer and the commodity. Thanks to advertising, the producer sells the commodity to the consumer; thanks to the Internet, the consumer is the commodity sold to the producer. This is the Utopia of borderless democracy: a shift of signifier in the desert of the Real. … In this desert it is forbidden to think. Even if Capitalism is the crisis, Capitalism must be the solution! Sad to say, my laughter at this kind of absurdity was not all comfortable innocence. I felt well rid of my own academic baggage reading that drivel. The way St. Aubyn satirizes politicians, parents, academics and the press is sizzlingly good. For most of the book, there’s really no one to like or to root for, and that can make it feel somewhat rudderless, but the plot has such a powerful engine that it’s not a big missing piece. I devoured it and wanted more. I just started reading this, and I’m enjoying it tremendously so far. The difficulty with satire is sustaining it, though–nearly always the author has to make a tonal shift toward the end, in order to retain some semblance of sympathetic-ness in the characters s/he’s been mocking all along. I keep thinking that I’d love Lost for Words as a series of newspaper columns–maybe one for each writer and one for each judge? Wouldn’t that be a fun series? Pure satire, and there wouldn’t be any need to worry about plot or making people sympathetic.